WifiExplorer is an 802.11 network discovery tool -- also known as a Wi-Fi scanner. It was designed for mobile platforms -- in particular, Android phones and tablets. Using your device's built-in 802.11 radio, it collects information about nearby wireless access points and displays the data in useful ways. 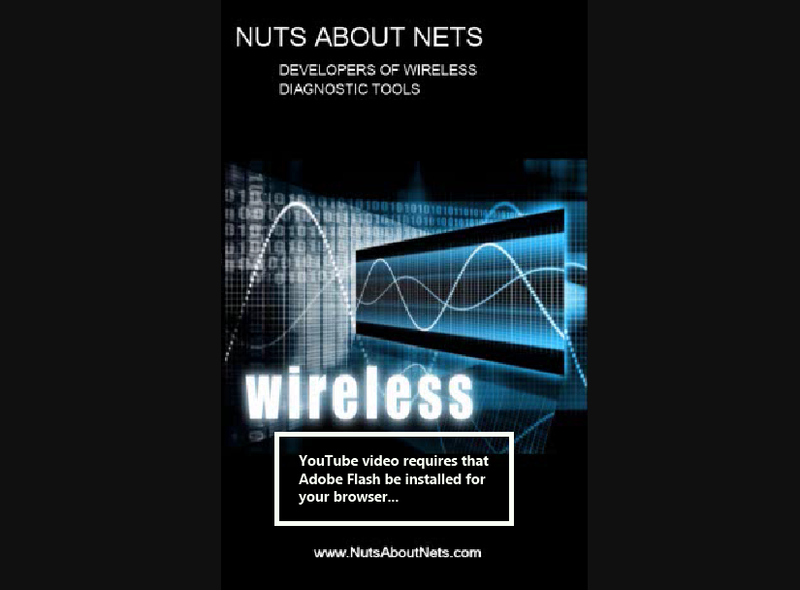 The diagnostic views are helpful when installing and troubleshooting Wi-Fi networks. WifiExplorer uses 5 diagnostic views that collectively provide an overview of your current Wi-Fi environment. In 'normal' mode all APs are displayed, while in 'Monitor Mode' only the APs of interest are displayed. WifiExplorer uses 5 diagnostic views that collectively provide an overview of your current Wi-Fi environment. Capture, save and email screenshots of the different diagnostic views. In a crowded environment with many access points, monitor only those APs that are of interest to you. WifiExplorer runs on Android mobile platforms — phones and tablets. Support for both 2.4x GHz and 5.x GHz scanning on devices with dual-band Wi-Fi radios. Site Survey View -- displays each AP's beacon signal strength and channel. When monitoring the 2.4 GHz ISM band, this view also emphasizes how Wi-Fi channels overlap with one another. 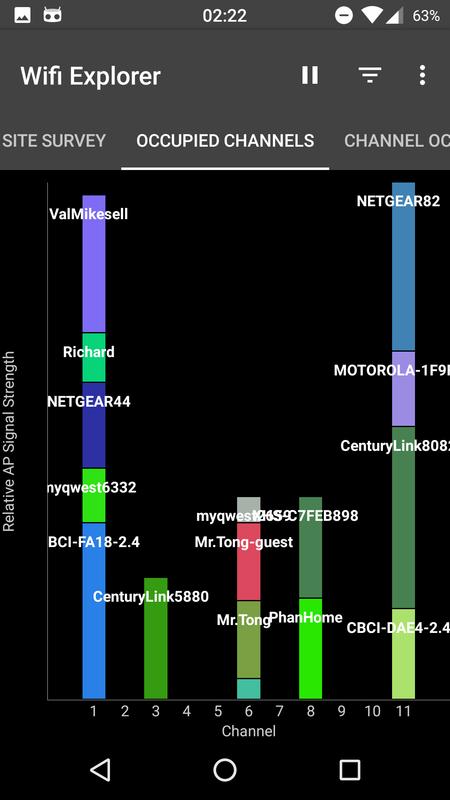 Occupied Channel View -- displays each AP's channel and relative beacon signal strength, emphasizing how the APs in your current Wi-Fi environment are distributed across different channels. 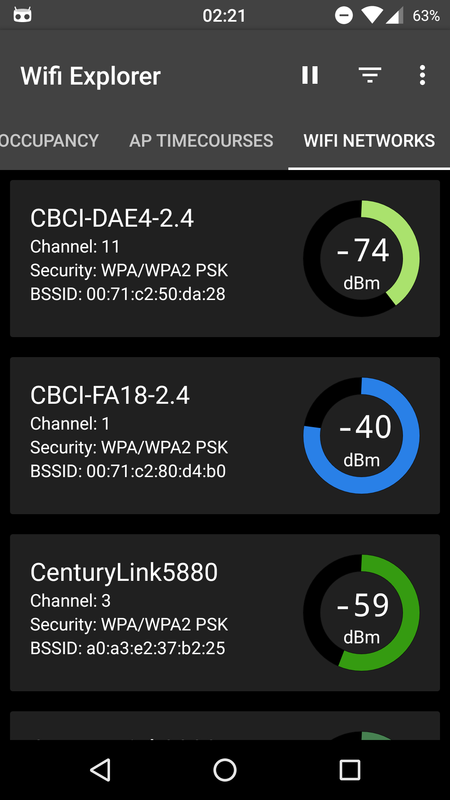 Channel Occupancy View -- displays how the APs in your current Wi-Fi environment are distributed across different channels. When monitoring the 2.4 GHz ISM band, typically you'll see most APs on channels 1, 6, 11 and few (if any) on the other channels. AP Timecourses View -- displays each AP's beacon signal strength as a function of time. This view is most useful when monitoring a particular AP and you are moving around to different locations. List of wireless routers -- lists all the wireless APs in your current Wi-Fi environment, along with their SSID, BSSID (MAC address), channel, frequency, security configuration and beacon signal strength (RSSI). Select which AP(s) to monitor -- this feature makes it easy to selectively monitor one or more APs. During installation of a wireless network, as an aid in verifying WiFi coverage and maximizing beacon signal strength. Reporting the presence of Wi-Fi networks and local access points and the signal strengths of their beacons. Conducting wireless site surveys where the installer is interested in learning about the coverage of a new or existing access point, roaming capability, presence of RF interference or “dead spots”, and optimum location of access points, their antennas and client stations. In a secure business environment, for use in detecting the presence of rogue access points. As a learning tool to help understand the relationship between access points (BSSIDs), wireless networks (SSIDs), and client stations (STAs). 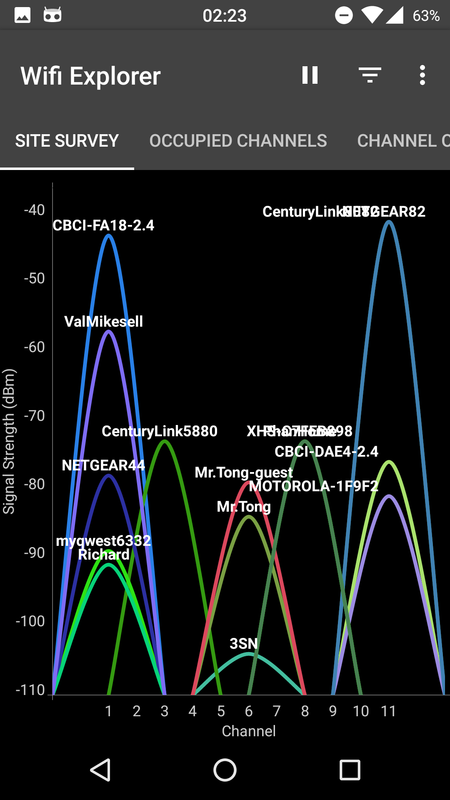 Site Survey -- Displays each AP's beacon signal strength and channel. When monitoring the 2.4 GHz ISM band, this view also emphases how Wi-Fi channels overlap with one another. 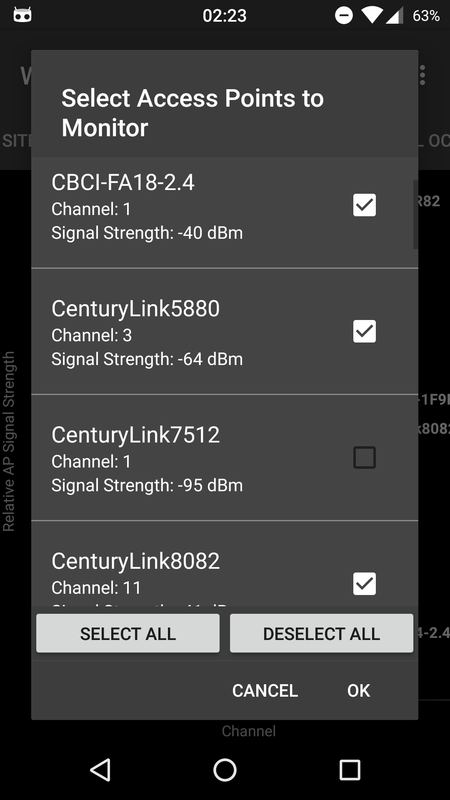 Channel Time Courses -- Displays each AP's beacon signal strength as a function of time. This view is most useful when monitoring a particular AP and you are moving around to different locations. 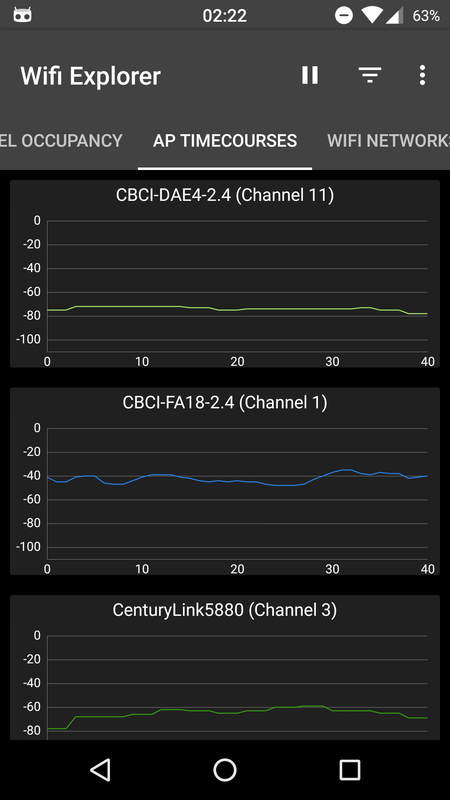 Occupied Channel -- Displays each AP's channel and relative beacon signal strength, emphasizing how the APs in your current Wi-Fi environment are distributed across different channels. List Of Wireless Routers -- This display lists all the wireless APs in your current Wi-Fi environment, along with their SSID, BSSID (MAC address), channel, security configuration and beacon signal strength (RSSI). 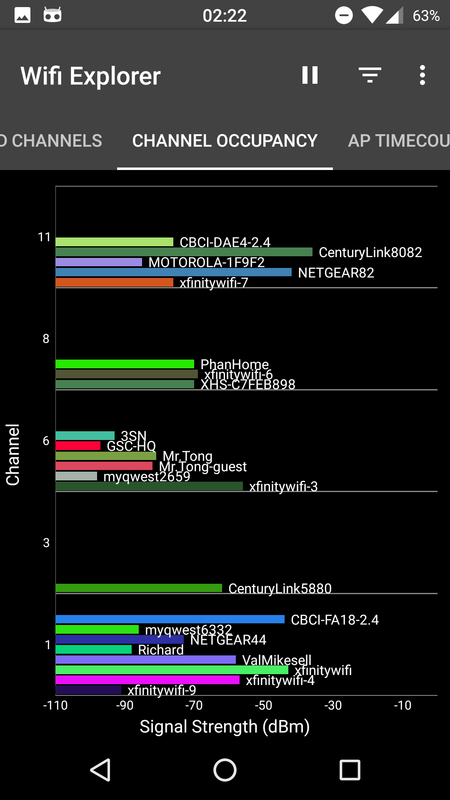 Channel Occupancy -- Displays how the APs in your current Wi-Fi environment are distributed across different channels. When monitoring the 2.4 GHz ISM band, typically you'll see most APs on channels 1, 6, 11 and few (if any) on the other channels.